Check-in anytime - no limits. 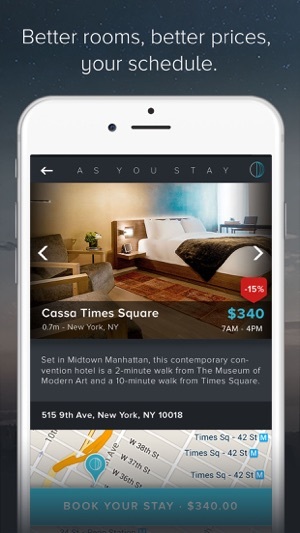 With our new As You Stay app, we’ve unleashed the true power of hotels, releasing them from their age-old constraints and allowing you to book rooms conveniently around your own schedule and needs, not theirs. Two clicks. That’s all it takes to locate a nearby hotel using your mobile device and book a perfect room to rest, recharge, and relax for as long—or as little—as you want. 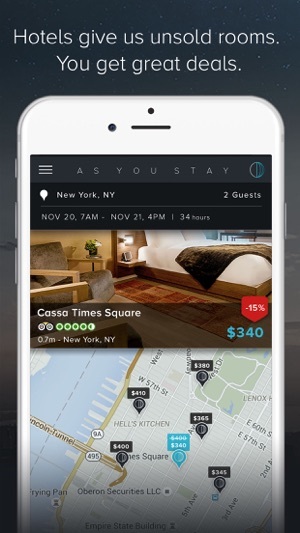 Tapping into our hand-picked hospitality partner network, you can specify the exact check-in and check-out times you desire without the requirement of an overnight stay. Just stop by the front desk, pick up your key, and it’s smooth sailing from there. Pretty cool, right? What’s more, this convenience doesn’t come at an extra cost, as you’ll be pro-rated a fair and attractive room rate for only the exact hours you stay. How do we know this? We hate overpaying for things, too, so we price-check constantly to ensure our hotel partners are giving you a square deal. SO WHO NEEDS THIS APP? The As You Stay breakthrough. We hope you’ll be part of it. Whether you’re a traveler on the go, are scrambling to arrange a business meeting, or hey, just deserve a little quiet time to yourself, your perfect short-term room reservation is right around the corner! I’ve experienced this app for the first time and so far I’m very happy. I needed to check in early and leave the day after on a late flight. Usually in the past I was booking the night before to get an early room to start my day early - but paying for a full night which I never used. Also I was checking out at 3pm and leaving my suitcase in the luggage room till my flight back. This time, using AYS I checked in at 7am and checked out the day after at 9pm - only paying for the extra hours! The lady from the reception knew about my arrival and the process was smooth. I must say that the I’ve saved a lot of money and enjoying my time till the last minute.. I must say the I’ve seen few reviews before about the prices that are not different from other websites etc. and I feel like the app was approved a lot cause prices are lower and seems like these guys are kicking it! I’m really suggest to try it cause I’m definitely going to use it again! I gave it 4 stars cause I wish they could give in the future an option to also book a non- refundable room ( I know it might be a bit more pricey). 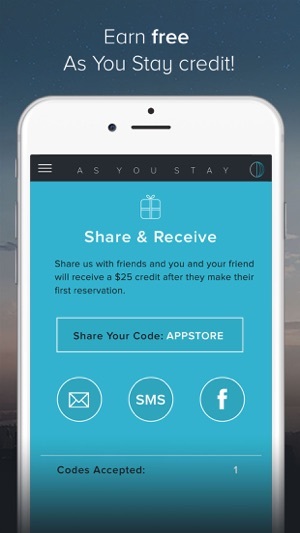 As You Stay is an ideal app for anyone looking to make more efficient use of hotel visits. Actually functioning later than Hotel Tonight, it’s the only way I could get a last minute room in NYC at 2am on a night out. Didn’t want to take the train back to Long Island, and with this well-designed platform I was able to get a room at a hugely discounted rate in Chelsea. The same way that Uber disrupted the taxi industry, As You Stay has the potential to change the way checking into a hotel operates. First, I love the concept. The fact they go by the hour is a huge thing that can revolutionize the hotel industry. There is great savings on some of these deals, so if you're a traveler and need to check out at 8am - why pay until 11am? And if you're checking in at 11pm - why pay from 3pm? When you think about it, it just doesn't make sense to pay daily anymore. I hope this app will be the one changing this. 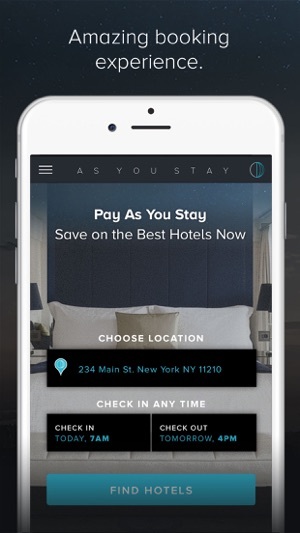 Pay as you stay, Inc.